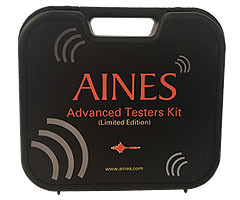 The AINES Advanced Testers Kit is a revolutionary Test Kit for Tracing, Continuity and Diagnostics. This is the most amazing, feature rich and a comprehensive kit in the market today to manage Voice, Security, Data and Video networks. single kit. No need for multiple tools. Convenient and cost effective. Twenty-three different tests and more: Identify, Trace and Check continuity of your cable networks swiftly. Ensure that polarity and PoE are problem free. A perfect match for your business continuity needs. with easy identification tags help conduct different tests, making life simpler. the tone output for perfect tracing. Saves time, enhances productivity. of ports. Helps timesaving and with limited maintenance issues. under pits without need for additional equipment. Minimises disruption in office environments. accurately trace the port, when working as a group. it when you trace cables from a distance. Visual indicators add to your assistance. signal bleed that can make tracing difficult in noisy environments. pin out of a cable / cord terminated with modular plug. Time saving and convenient. 60-minute auto shut off: Prevents the batteries from running low. Low battery indication: Gives adequate notice for any battery change. you trace concealed or buried wires. Braided cables for longer life: Insulated for safety and braided for long life to give you better return on investment. without stripping or doing a destructive test. 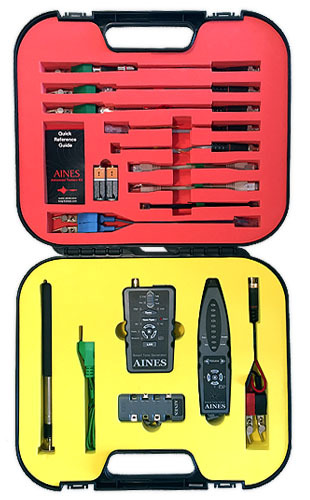 Hard plastic shell with rubber moulded carry case: Protects and organises the complete kit. Splash proof, weather proof: Enables outdoor work. Lanyard for convenient holding and operation: Prevents accidental falls and breakage.